Greetings and happy Friday Eve! 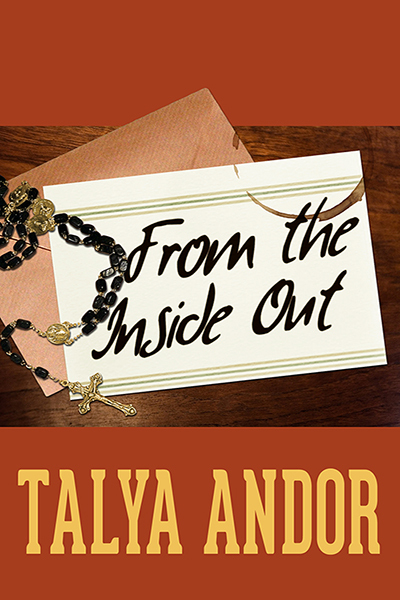 Tonight, I’m opening up a giveaway for an advance print copy of my novel, From the Inside Out. I am giving away a print copy of From the Inside Out, signed and personalized with a greeting of your choice. I will ship anywhere that accepts delivery of U.S. mail. 1. Sign up for the giveaway between now and Friday, March 1st. 2. Comment here to sign up and include your name and email so that I can contact you! If you do not include your email or a means to contact you, your entry is disqualified. Optionally, tell me why you’d like a copy, I’m eager to know what brings people here. On Saturday after the sign-up closes, I’ll put names in a spreadsheet and give the number range to Random.org which will choose the winner’s number. Thanks for reading! Check back this weekend for more fun stuff, I’ve got a guest blog and a new author spotlight coming up, and I’m ramping up toward Appetite’s release week. Hi there! That’s five entries for you, since I know all the places you’re following me. 🙂 Good luck with the giveaway! Hi! My email is dow.nathan at gmail dot com. I’ve read your fanworks for a while and this one in particular I’ve been wanting to get. 😀 Following you here on WordPress. Also following you on twitter (@nrdy1), facebook (the name from my email), and tumblr (“thederpside”). Hooray, that’s five entries for you! Thanks very much, and good luck with the giveaway! gajastar AT gmail DOT com ! I follow you on FB and I’m preeeeeeeeeeeeeetty sure on Goodreads, too, since I get all your updates over there and all. Welcome to the giveaway, stranger! Got you down for six entries, and good luck! Hallo again Cecille! 😀 Man, it’s been a long time since I started that story, hasn’t it? Thanks for seeing it through with me! I’ve got you down for four entries, and good luck with the giveaway. Hello again! 😀 I’ve got you down for five entries, and good luck! Direct your pleas at the almighty Randomizer! 😉 Okay Julia, I’ve got you down for three entries, and good luck! My name is Kim and my email is hess_kim@hotmail.com. I would love to win a copy of this book, because I absolutely adore it! I first read it as a fan fiction when you had posted it on THF and I was instantly hooked! I think I read it three, maybe four times, while it was on the site. I was pretty sad that it had to be taken down, but I am so thrilled that you have gotten it published!! As soon as I knew it was available as an ebook, I bought it as well. It would be so awesome to have my very own copy that I could hold in my hands! It’s a magnificent story and I can’t describe how much I really, really love it! It’s definitely one of my favorite books/stories I have ever read! I follow your blog here, I follow you on Goodreads and I follow you on Tumblr. Hi Kim! It actually did start out as original fiction, though I was able to finish the last fourth of the story with the help of Tom and Bill. 😉 I’m very happy it’s published, too! Holding a physical copy in my hands was an amazing feeling. I’ve got you down for four entries on the giveaway, and good luck with it! This book sounds so interesting. I would love to read it! Hi Cynthia, I’m glad! Thanks for stopping by, and good luck with the giveaway. Please include me in the running! I’m entering your contest because I’m actually unfamiliar with your work and want to take this opportunity to change that. I’m particularly interested because the summary sounds really fun. I’m following you on Goodreads. Hello, I’m Elezbed. I follow you from the Less than three press (I am an old member here… I remember when Megan Derr was Amasour soooooooooooo) and I tend to read all the books from this editor (I love happy ending XD). And I read Fireborn (It was good!) even if I was afraid for the happy ending …. XD! and I read also Signal to Noise! So I want to see what you write in contemporain work ! Hi Talya! Thanks once again for the opportunity to get a signed copy of your book! Hi Jo, it’s my pleasure! Wow, you’ve been with me for such a long time. 🙂 Be patient with me for Morgan Vale, but I do want to try and improve that to the point I can submit it for publication. Thanks for following me, and I’ve got you down for three entries – good luck! Hi Kayla! I would love to count your entry, but I don’t have an email or any other way of contacting you! If you drop by and add an email, I can count your entry. Hi Jeanette! Less Than Three has a lot of great stuff, I agree. 😉 Thank you and good luck with the giveaway. Hey! I’ve love to be entered in this contest! Email is efoster919(at)yahoo(dot)com! Hi Izzy! Welcome to the giveaway, I’ve got you down for four entries. 🙂 Thank you and good luck! I want to say thanks since you do so many giveaways! I’m Ashley (ashespashes784@gmail.com) and I follow you on twitter, wordpress blog (get all of your emails), tumblr, and on goodreads, my name is ashespashes on all of them. I would love to win because I love your stories and it would be nice to have one on my bookshelf. Hey Ashley! It’s my pleasure, I’m glad you stopped by for it. 🙂 I’ve got you down for five entries, and good luck with the giveaway! Hi! Thanks for another awesome giveaway! I’m Isabelle (jumbie22), isa.dube2@gmail.com. I follow you on twitter (jumbie_22), tumblr (libertefreiheitfreedom), goodreads (jumbie22) and Facebook (isabelle dube)! Hallo Isabelle! I’ve got you down for five entries on the giveaway. Thank you so much for your support! The giveaway is how I show my gratitude. 😉 Good luck with it! I am following you via email (insidesky). I am following you on Tumblr, as shibu-ya, and Goodreads, as Cloud. Hey Frost! Yep, I can PM you on LJ. 🙂 I’ve got you down for four entries on the giveaway, thank you for the follows! Right now I’m recuperating from sickness, but thank you for your kind thoughts. Good luck with the giveaway and I hope you have a great weekend too! Hey there, I would love to sign up! I’m following you on twitter (falling_rain), here on wordpress (I think), and on facebook (Dezaray Heinecke) and my email is itsybug@gmail.com. Right on, I’ve got you signed up! 🙂 Thanks for the follows, and good luck with the giveaway! You are counted! 🙂 Thanks for entering, and good luck with the giveaway. Glad to hear it! :3 I’ve got you signed up for the giveaway, good luck!